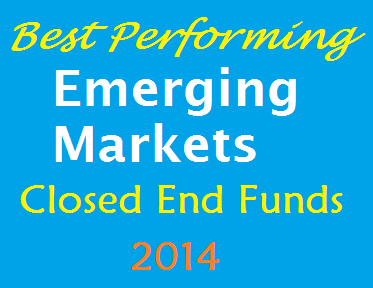 Find top performing emerging markets bond closed end funds 2014. Top CEFs are AllianceBernstein Global High Income, DWS Global High Income, etc. Closed end funds are popular among income seeking investors. You can find an undervalue fund with high yield for investment. There are several different classes of closed end funds such as municipal bond fund, taxable bond fund, equity fund, international stock fund, etc. Most popular sectors are municipal bond funds and taxable bond fund. With current high yield of emerging markets sector, you might want to check the opportunity in the region. This bond fund invests in variety of debts in developing countries such as Brazil, China, Russia, Argentina, Turkey, etc. The top performing funds are selected based on its year-to-date performance in 2014 (up to 2/16/2014). You can find the fund review below including the fund holdings, expense ratio, return, yield, and many more. AllianceBernstein Global High Income fund utilizes its assets to purchase high yielding government and corporate fixed income securities. The fund managers are Paul J. DeNoon and Doug Peebles. This top performing emerging markets bond CEF has a high yield of 8.09%. Its espense ratio fee is 0.98% per year. Total assets are $1.2 billion. In 2014, this emerging markets bond fund has a year to date return of 4.64% (up to 2/16/2014). The average 3 year price return is 11.41%. Morningstar ranked this best bond fund with 4 stars rating. The average maturity is 7.01 years. 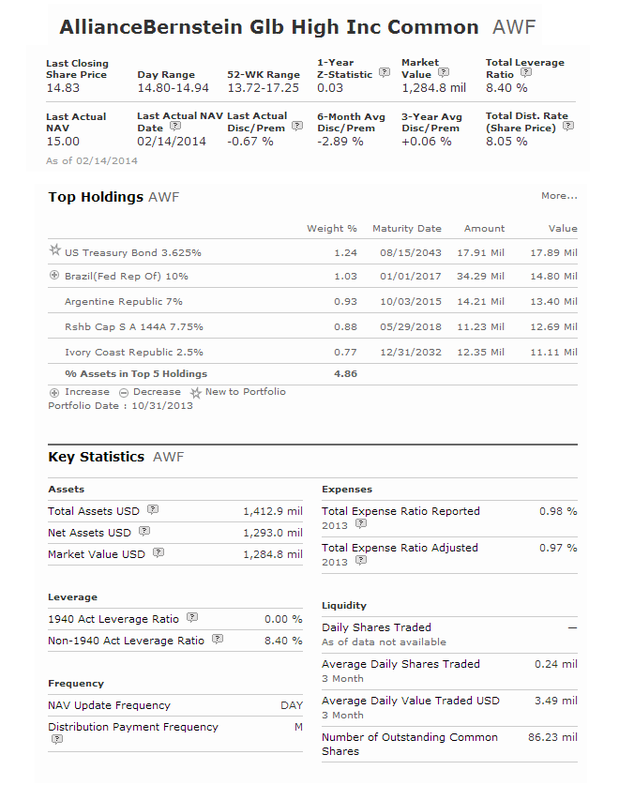 The top 3 holdings are US Treasury Bond, Republic of Brazil Bond, and Argentine Republic bond. 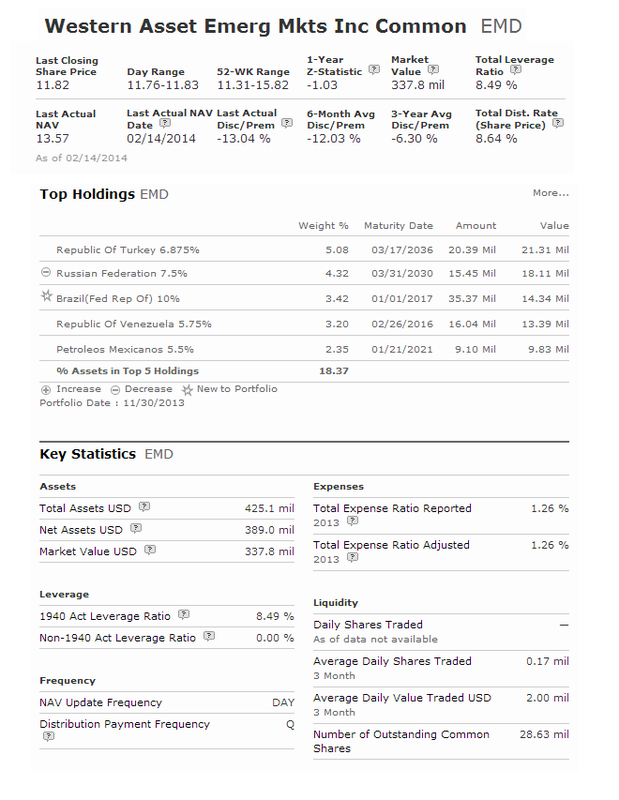 With $55 million of assets, this DWS Global High Income fund also has a high yield of 6.69%. This closed end fund invests in variety of global income debts. This bond fund also has an effective leverage of 26%. Its current shares price is $8.07. Ranked with 3 stars rating, this top performing emerging markets bond CEFs has returned 8.23% over the past 3 year, and 13.52% over the past 5 year. The YTD return is 1.34%. The top 5 country allocation is USA, Brazil, Russia, Luxemburg, and Canada. Western Asset Emerging Markets Income uses its assets to buy emerging market government debt securities. The total net assets are $425 million. The fund managers are James E Craige and Peter J Wilby. The distribution rate is 8.66%. Morgan Stanley Emerging Markets Debt is a 3 star emerging markets bond fund. In 2009, it has a total return of 52.95%. The current market price is trading at 13.82% discount from its net asset value (NAV). The top 2 holdings are Russian Federation 7.5%, and Venezuela Rep 9.25%. This high yield bond bond fund has an average effective duration of 5.58%. The average credit quality is BB.